An update a little 'different than usual for one of them (or maybe smaller?) 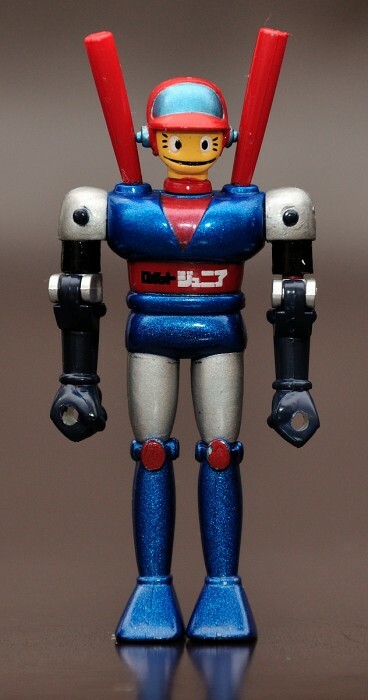 Absent in the series Soul of Chogokin: Junior Robot (Robot Junior in the original version), the funny robot piloted by Shiro Kabuto. The robot was one of the first Chogokin outputs for the original series, namely the sixth; is in fact released as GA-06 in 1975, shortly after the two Mazinger and Getter 3. What I show you is not, however, the vintage (it costs too much, unfortunately), but one of the beautiful gashapon with metal parts released by Bandai between 2002 and 2003. Particularly in this metal are the blue parts of the legs. I hope this post can serve as an omen for future SoC: we would keep really have a Junior SoC!